Colby Creative specializes in mission-based branding and creative development for independent schools and non-profit organizations. Citrus Studios just launched the Agent18 website! We worked closely with Agent18’s internal design team to create a web site more intuitive, engaging, modern & fresh. The site also showcases Agent18’s new brand identity/logo. Agent18 strives to protect your precious electronics so you may talk, type, sing, or dance your way through everyday life without worrying about security. They’ll keep you looking stylish with products that are functional, spark conversation, and get you noticed. Stay in the loop with Agent18! 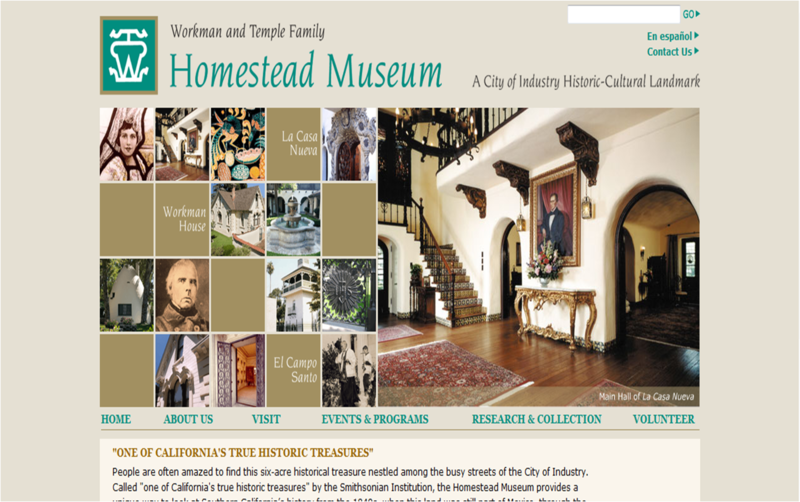 Our latest website launch- the Homestead Museum site. The design gives the website visitor a greater understanding of this historic landmark, and provides extensive information on the museum’s history. A great place to add to your list of sites to see in Southern California. The Homestead Museum is a place to explore the history of the Los Angeles region from 1830 to 1930 in hopes of better understanding the past and people’s ability to shape history. The six-acre site features the Workman House, an 1870s country home constructed around an 1840s adobe built by William and Nicolasa Workman; La Casa Nueva, a 1920s Spanish Colonial Revival mansion noted for its architectural crafts, built by the Workmans’ grandson Walter Temple and his wife, Laura; and El Campo Santo, one of the region’s oldest private cemeteries, containing the remains of Pío Pico, the last governor of Mexican California, and many other prominent pioneer families. Check out the website’s Calendar for events, tours and programs.